NEW! The new ATN SnapRatchet makes the Spinnaker Sleeve easier to use! is an accessory for racing or cruising! lets you raise and douse a spinnaker with ease. a unique bosun's seat that will allow you to get up your mast safely and quickly , using your leg muscles, without any outside helP . TACKER SIZE A works with your spinnaker. The ATN Tacker makes your spinnaker easy to fly without the spinnaker pole. The tacker "A" is good for boats up to 33 foot. Use the Tacker "B" for boats up to 45 foot and Tacker "C" for up to 70 foot. ATN TACKER works with your spinnaker. The ATN Tacker makes your spinnaker easy to fly without the spinnaker pole. The tacker "A" is good for boats up to 33 foot. Use the Tacker "B" for boats up to "45" foot and Tacker "C" for up to 70 foot. TACKER SIZE C works with your spinnaker. 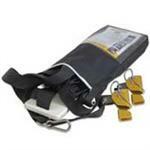 The ATN Tacker makes your spinnaker easy to fly without the spinnaker pole. The tacker "A" is good for boats up to 33 foot. Use the Tacker "B" for boats up to "47" foot and Tacker "C" for up to 70 foot. GENOA SLEEVE PRICE PER FOOT Covers your genoa sail protecting it from sun, weather, and pollution. No need to take your sale down each time you use it. Protects ALL your head sails for one cost. No need to sew on sun shields to EACH different sail. GALE SAIL: Since it is hoisted over the furled head sail, the Gale Sail prevents any dangerous accidental unfurling. The safest and easiest way to hoist a storm jib in storm conditions. No need to lower your head sail, Orange band clips around head sail. SPINNAKER SLEEVE PRICE PER FOOT ATN Spinnaker sleeve makes sailing with the spinnaker a FUN day on the boat. Easy to handle even for a family sailing. No need for the entire race crew to be with you to fly the beautiful spinnaker.